The perfect companion for mastering the latest version of Fedora As a free, open source Linux operating system sponsored by Red Hat, Fedora can either be a stepping stone to Enterprise or used as a viable operating system for those looking for frequent updates. 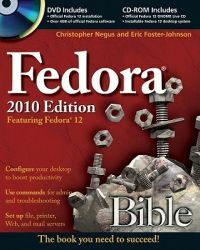 Written by veteran authors of perennial bestsellers, this book serves as an ideal companion for Linux users and offers a thorough look at the basics of the new Fedora 12. Step-by-step instructions make the Linux installation simple while clear explanations walk you through best practices for taking advantage of the desktop interface. You'll learn how to use the Linux shell, file system, and text editor. Plus, the authors describe key system administration skills, such as setting up users, automating system tasks, backing up and restoring files, and understanding the latest security issues and threats. Coverage includes: An Overview of Fedora Installing Fedora Getting Productive with the Desktop Using Linux Commands Accessing and Running Applications Publishing with Fedora Music, Video, and Images in Linux Using the Internet and the Web Understanding System Administration Setting Up and Supporting Users Automating System Tasks Backing Up and Restoring Files Computer Security Issues Connecting to the Internet Setting Up Printers and Printing Setting Up a File Server Setting Up a Mail Server Setting Up an FTP Server Setting Up a Web Server Setting Up an LDAP Address Book Server Setting Up a DHCP Server Setting Up a MySQL Database Server Making Servers Public with DNS Setting Up Virtual Servers Whether a new or power user of Fedora, you'll benefit from Fedora Bible 2010 Edition: Featuring Fedora Linux 12 . Note: CD-ROM/DVD and other supplementary materials are not included as part of eBook file.